I’m a little late posting about reading challenges this year–already nine days into the year! But that actually fits rather well, as my plan is to be a bit more laid-back about challenges, and to try something a little bit different. Nothing was jumping out at me in my usual kinds of challenges–pledging to read a genre or (as I did for a couple years running) to finish series. The only thing that occurred to me right away was that I’d really like to revisit excellent books–not favorite books, because I’m pretty good at going back to the beloved books on my shelves. But I’d like to go back over my eleven years of tracked reading and find some excellent books I’ve forgotten, or at the very least haven’t revisited in a very long time. 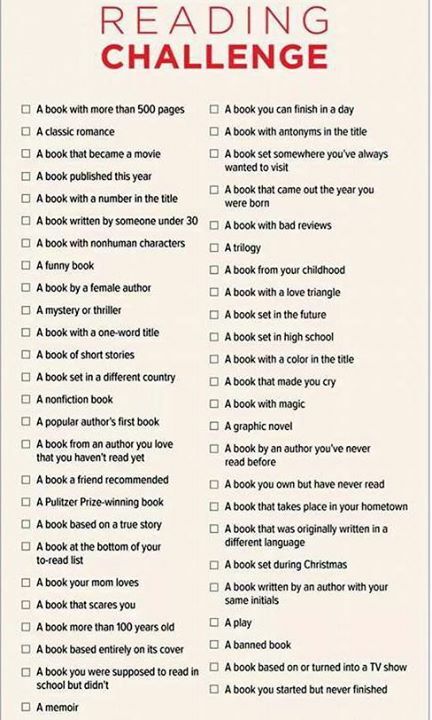 So my one official challenge this year will be the Re-Read Challenge from “So Obsessed With” (which pretty well describes my reading life too…!) It seems like the right time for it, since I got my To Be Read list reduced in 2014! Apart from re-reading, I thought I’d take a very different direction with other reading goals… A librarian friend posted this chart to Facebook a few weeks ago, and it seemed intriguing! I plan to not plan for at least the first several months of the year, see what lands where, and then try to fill in the gaps. And beyond that, I’ll just see where the reading takes me. Do you have reading plans for 2015? Any goals you hope to meet? I’d love to hear about them! Good luck with your challenges. I like the sound of the re-read challenge as I too want to make more time for re-reading this year. I also hope to continue to make good progress through my Classics Club list, and I am looking forward to the annual spring Once Upon a Time Challenge. Good luck on your challenges too! I always like seeing what you read for your Classics Challenge. I like the Facebook chart Reading Challenge – that is a clever idea. I am not one for reading challenges. With my busy schedule it’s a challenge to set aside time to read regularly at all. But that one is intriguing. Thanks for sharing it. I just may give it – or at least some of it – a go! I thought this was a fun, different one–and definitely would be worth doing, even for a percentage. And I thought you might have a go at my Local Heroes Reading Challenge – you don’t have to do many, and you can use it in another category too, if it fits! Good luck with your re-reading this year! That sounds intriguing…I’ll have to see if I can find anything in my town! Or I might expand it to my region…it would open the possibilities! Once Upon a Time? What is that? Just kidding! Scary how soon that will be upon us…though I cannot wait, I’m ready for Spring.